The final part of the jigsaw then and the two forwards to play in a 4-4-2 formation. 50 years ago Johnny Summers was the darling of The Valley, in the 60's we had Eddie Firmani and Stuart Leary, during the 70's there was King Arthur Horsfield, and in the 70's and 80's we had Killer Hales and Mike Flash Flanagan. We ended the 90's with Super Clive and Andy Hunt but sadly both of those players were to end their careers abruptly by injury and illness. Clive played his last game for us at 32-years of age and Andy at just 30. In fact Mendonca didn't even play in this decade after his career was sadly ended prematurely by a hip injury. Hunt meanwhile stole the limelight in our championship winning year by scoring 25 goals. Of course finding a goalscoring forward languishing in the youth team, someone else's reserves, going cheap in a transfer window or in an agent's un-photoshopped dvd is harder than unearthing Osama bin Laden. This decade few strikers actually stick in the mind like players I listed in the opening paragraph but a fair few did give us some good service and a few nice memories too. Then of course there was Darren Bent, who was our goalscoring darling of the decade. Andy Hunt's record in September 2000 was played 8 games and scored 4, which included two at Highbury in a stirring 5-3 defeat. He also scored a header in the 2-2 draw at home to Coventry but was withdrawn after an hour. Hunt said at the time: "About the sixth game, at home to Tottenham, I just felt like I'd hit a brick wall. 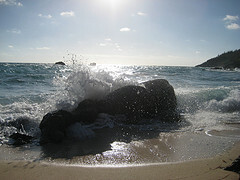 It was like carrying a really heavy load around all the time, and from then on it just didn't go away." Hunt never played a first team game again after suffering from chronic fatigue syndrome. One would assume retiring from something that you love doing because of chronic fatigue would be unbearably hard but Andy and his wife Simone moved to Belize and built up a very successful adventure holiday business, which is now on the market as they plan to move back to Europe. Shaun Bartlett came as a bit of an unknown quantity from FC Zurich, initially on loan but he signed at the end of the 2000/1 season for £2 million. After coming on as a 67th minute sub at Liverpool, the South African started the next game at home to Man Utd and scored the opener in the breathtaking 3-3 draw. His 2nd in the 79th minute was the catalyst for John Robinson to get the late equaliser. Bartlett scored another 5 in 18 games in his loan spell but once signed permanently he was never as prolific. He did put in some excellent performances though over the next five seasons often being our last line of defence at set peices. Apart from the fact he used to live a couple of doors away from me and I used to chat to him when he washed his car, my overriding memory of Shaun was his goal of the season at home to Leicester in 2001. Jason Euell was one of our first big signings, bought for a still record fee of £4.75 million from Wimbledon after he scored 19 goals in the Dons' first tier one season after relegation. Euell was always a cross between an attack-minded midfielder and a striker and he was hardly booming in front of goal but 11 in the league in that first season (2001/2) was almost a third of our total and they without any doubt helped keep us up. Amongst those goals at The Valley were memorable braces against both West Ham and Chelsea. Euell got 10 the following season (2002/3) and 10 the next (2003/4) but goalscoring did become a bit sporadic for Euell, and one-on-ones which he often found himself in due to a good turn of pace were often fluffed. In fact Curbishley, as was his want, regularly played Euell in midfield (my, did Curbs love a utility player) as Bartlett, JJ, Di Canio, Lisbie, Carlton Cole and Jeffers all at some point vied for his place. Euell overcame the terrible death of his newborn daughter while his girlfriend was in labour in early 2002 but remarkably kept his form until the obligatory dust up with Curbs. They did make up but a shoulder injury kept him on the sidelines for most of 2005/6. Euell was set to join Birmingham City in January 2006 but an injury crisis at the Midlands club led to a change of priorities and the deal fell through but he did leave for Middlesbrough seven months later. By the time JJ moved to Scotland in January 2006 the Finn divided supporters but what can never be overlooked was the dramatic beginning to his Charlton career. Signed from Scottish champions Rangers for £3.75 million after we won promotion he scored 7 goals in his first 8 games. Later he scored at home to Chelsea and on New Year's Day he was the matchwinner at home to Arsenal but not before scoring twice at Maine Road in the 4-1 stuffing 9 years ago yesterday. JJ finished with 14 for the season. As so often with our strikers JJ could not continue his goalscoring feats and managed just 5 the following season but two did come in the climactic 4-4 draw at home to West Ham in November, including the last gasp equaliser. In the ensuing Premiership campaigns JJ found himself more and more of an impact player coming off the bench but he kept up a knack of scoring in local derbies by being one of four goalscorers in the famous Boxing Day victory over Chelsea. JJ did find again his scoring touch whilst on loan to Norwich at the end of the 2005/6 season but a move never materialised and he then moved on a free to Malmo in July 2006. He is currently at St Johnstone in the SPL. Deon Burton is a journeyman footballer having played for 12 clubs in his 16 years as a pro. Signed with very little fanfare from Sheffield Wednesday by Parky originally on loan at the end of November 2008, he scored once before the move was made permanent in January of this year. It was 17 games before Deon got put the ball in the net again but Wayne Rooney would have had difficulty scoring in the same team. Some Addicks claimed they had already seen something in Jamaican's play before he claimed a true striker's hat trick at home to Norwich on the last game of our season horribilis. A level down Burton has been a real stand out this season and it feels good to see a striker scoring goals again. Deon has 12 so far and deserves his place on my short list. One season was enough to witness the mystery and the power of Paulo Di Canio. Curbs showed him a video around his house of where we had come from in the summer of 2003 to convince the Italian, who grew up himself amongst tough times in a Roman suburb, that Charlton was to be home after leaving West Ham following their relegation. His signing was an 'Allan Simonsen' moment and it is widely belived that Di Canio took a large pay cut to join. 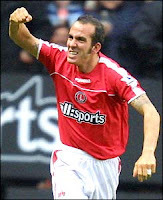 I was at his debut at Wolves when we were four-up at half-time (those days don't come along very often as a Charlton supporter) and then if that wasn't enough Di Canio ran on in a red shirt as a substitute in the 77th minute. Alas it was only to be one season, despite Di Canio's promise of two as his boyhood club Lazio came calling but 35 games were enough for us all to be hypnotised by the beauty and the art of Paulo Di Canio. The outrageous chipped penalty in front of the Covered End against Arsenal being his Charlton eulogy as we finished the season 5th, our highest league position since 1953. £2.5 million doesn't get you much these days, it certainly wouldn't fetch a Darren Bent who has scored 62 Premier League goals in 120 starts for three clubs but that is what Curbs paid Ipswich for a 21-year old boy from Cambridgeshire. Benty scored two goals on his debut at ironically Sunderland and then the winner at home to Wigan five days later. In fact he started the 2005/6 season with eight in eight and we had unearthed (what Ipswich supporters already knew) something special. Just as Firmani, Leary, Horsfield, Hales, Flanagan and Mendonca had become the darlings of The Valley, Darren Bent was about to join them. Benty however was scoring goals, of all kinds, at the highest level of football in the country and against the best teams. His second season was a dismal one for us all. He played under three managers but with relegation almost a certainty he committed to stay and fight in January 2007 and for that we will always be grateful. Unbelievably he still managed 15 goals in our relegation season and signed off with a superb volley at Anfield in our final game. 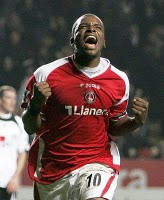 Mention Darren Bent to a Charlton fan and it will always evoke a knowing nod and a smile. Legends don't normally fossilise over two seasons but we make an exception for Darren Bent. Paulo Di Canio and Darren Bent missed each other by a couple of seasons, but what a fanciful front pair they would make, eh?